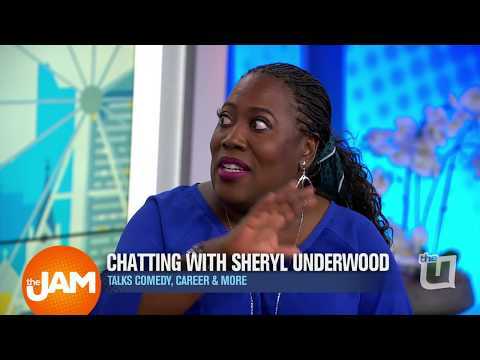 Sheryl Underwood is a comedian, actress, and television host, best known for co-hosting the Emmy Award-winning daytime talk show The Talk on CBS. In 2010, Sheryl joined the cast of The Talk and won the Daytime Emmy Award for Outstanding Entertainment Talk Show Host in 2017 and the NAACP Image Award for Outstanding Talk Series in 2016. She was also a two-time host of the Daytime Emmy Awards. Sheryl gained public acclaim as a comedian after twice-winning the BET Funniest Female Comedian on Comic View, along with the Platinum Mic Viewers Choice Award. Sheryl began her radio career after appearing on The Steve Harvey Show. She then hosted The Sheryl Underwood Radio Show on Jamie Foxx's Sirius Satellite Radio channel, The Foxxhole, across 282 affiliate stations, and currently is the host of The World According to Sheryl Underwood podcast. Official Site: Pack Rat Productions LA Times: "Sheryl Underwood stood out because she rejected industry expectations. Now she's on 'The Talk.'" Sheryl Underwood is a savvy businesswoman, philanthropist and a multi-faceted, multi-media entrepreneur who is recognized as one of the most articulate, well-informed women of our time. Underwood is co-host of the Emmy award winning CBS television show THE TALK, watched by an average of 3+ million viewers per day and is a much sought after entertainer and public speaker who is described as one of the world’s brightest contemporary humorists. Underwood is Owner and Chief Executive Officer of Pack Rat Productions, Inc. and is the 23rd International President of Zeta Phi Beta Sorority, Inc.; the only full-time entertainer to ever hold the sorority’s highest post. Underwood holds an Honorary Doctor of Humane Letters from both Benedict College in Columbia, SC and South Carolina State University in Orangeburg, SC; is national spokesperson for Kimberly-Clark’s DEPEND brand Underwareness Campaign, hosts Sheryl Underwood Radio and recently launched Sheryl Underwood Radio – The APP. Committed to using her visibility and influence in positive ways, Sheryl Underwood is Founder & Chief Executive Officer of the Pack Rat Foundation for Education (PRFFE) and is currently raising money to support the 105 Historically Black Colleges and Universities (HBCUs) and the students committed to pursuing a higher education. Her life story was the subject of the TVOne bio-documentary UNSUNG Hollywood: Sheryl Underwood. Underwood joined the television show THE TALK on CBS for the start of season two, sitting alongside hosts Julie Chen, Sara Gilbert, Sharon Osbourne and Aisha Tyler. With Underwood at the table, THE TALK received its first Daytime Emmy, and multiple year renewals on CBS television. Underwood, who has received numerous awards and accolades, was named one of the 10 most influential talk show hosts on Twitter in 2012 and currently has over 760k Twitter followers. As part of THE TALK hosting team, Underwood recently received a 2016 People’s Choice Award for “Favorite Daytime TV Hosting Team,” an NAACP Image Award winner for “Outstanding Talk Series” and an exclusive feature article in PEOPLE Magazine. Underwood has been featured in Ebony, ESSENCE, Entertainment Weekly and in other major media outlets and has been a guest on numerous television programs including multiple episodes of the Emmy winning CBS daytime drama The Young and the Restless. She made her first of several scheduled appearances as the character “Diane” on the CBS comedy THE ODD COUPLE and as “Emmy” on the Bold and Beautiful; and she brings her signature personality and energy to Celebrity Name Game for multiple episodes. She has starred in such films as Bullworth (starring Warren Beatty), I Got the Hook Up and Beauty Shop (starring Queen Latifah). In addition, Underwood was the host of Black Entertainment Television’s (BET’s) Comic View and Holla, a talk show she created and produced which was loosely based on Bill Maher’s Politically Incorrect. She is a weekly contributor on the Steve Harvey Morning Show, also serving as “guest host,” and appears on The Steve Harvey Project, the television version of the show airing on BET Centric. Underwood also hosted The Sheryl Underwood Show on Jamie Foxx’s The Foxxhole, airing on Sirius 106/XM 149, where she provided a mix of political satire, comedy and music. Underwood was the host of Martin Lawrence Presents 1st Amendment Stand-Up and is a former contributor to the Tom Joyner Morning Show. Underwood has appeared on the Dr. Phil Show, FOX television network morning show Fox and Friends, the Joy Behar Show, WPIX in New York City, The View, created by ABC News Correspondent Barbara Walters, OMG! Insider and CBS This Morning. In 2013 Underwood was honored with the UNCF Masked Award at the UNCF’s Annual Mayor’s Masked Ball in Los Angeles, California. She, along with NBA Hall of Famer and entrepreneur Earvin “Magic” Johnson, were recognized for their support and donations that provided hope and opportunity to young people attending UNCF affiliated colleges and universities. She is the recipient of the Arch of Triumph Award presented by Johnson C. Smith University in Charlotte, North Carolina and is a member of the Board of Trustees for Benedict College in Columbia, South Carolina.